Beautiful outbuilding, (studio) at 800m. the navy Lobra, where you can book sightseeing tours for Capri, Positano, Amalfi, rent boats with or without sailor. Characteristic marina visible from the terrace garden of the annexe in a quiet location but not far from the center of Sorrento ... Bus stop under the house. Outbuilding of a prestigious palace villa surrounded by green olive grove that slopes down to the sea. E 'consists of bedroom with double bed, bed linen, iron, TV, stereo, wifi, air conditioning. Kitchenette with oven, full tableware, kitchen towels. Large bathroom with shower and bath linens. Large upper terrace, with table chairs and umbrella, two comfortable beds and a shower outside. kissed by the sun from noon to sunset. Garden with large gazebo typical of the Amalfi Coast, furnished with big table and benches where you can receive friends and Barbeque area with barbecue provided. 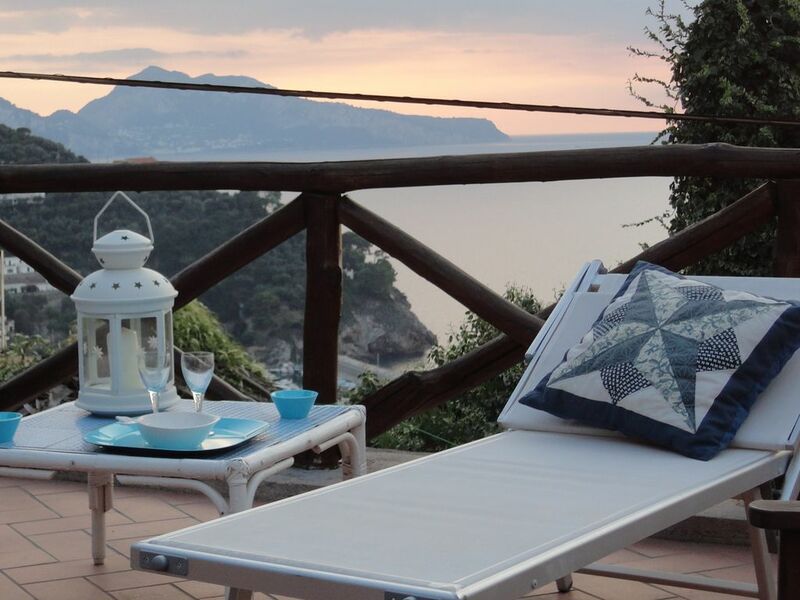 From the terrace -garden you can witness, lying comfortably on the two hammocks provided the greatest wonder of the sun setting on Ischia and Procida Capri or simply having dinner with a glass of wine! It 'an exciting show!The independent access to the Annexe occurs from the road via pedestrian gate directly in the garden-lemon that is for the exclusive use of the guests of the two annexes of the villa, which have 2 hammocks and a sitting area with sun-loungers and umbrellas. And 'the guests a parking space inside the property, (the car park is valuable in Massa Lubrense as there are many possibilities to find parking spaces in the street and if you find it is very expensive) .There is the possible meaning in the case of arrival in Sorrento by train, shuttle service by prior arrangement, on arrival and departure. Suitable for a couple (romantic). Patrizia's Cassa is just as she describes it.... Paradise. The view from the roof top terrace is picture perfect with a gorgeous sunset every night. Patrizia is a wonderful host . . . friendly, helpful, and genuinely interested in the quality of your stay yet at the same time respectful of your space. Spend a day exploring the hidden walkways of Masa Lubrense. Delightful! Thank you, Patrizia, for your recommendations, booking our day trip to Capri and lovely conversations! Ciao! My husband and I enjoyed the peace and serenity at Patrizia's property. The view is exactly as seen in her pictures. Patrizia was very helpful in arranging or guiding our excursions. Her recommendations were spot on. The beach/port is about a mile walk down hill from her property, but worth the walk. She was able to arrange car service, free of charge, to a restaurant in the port. We took advantage of this a couple times during our stay. Massa Lubrense is a quiet town, which as perfect after 5 days in Rome. It was easy to get to Sorrento from Massa Lubrense, just a 15 minute bus ride. Everyone was very helpful and friendly. I would highly recommend Patrizia's property for your stay for this area of Italy. Wonderful place, wonderful host. Unbeatable. This is a beautiful place, in a stunning location. Massa Lubrense is a beautiful, quiet town that is cheaper, quieter and pretty much as convinient as Sorrento. Buses go regularly to Sorrento and elsewhere in Amalfi and it's very easy. Avoid Taxis in this area - eye-wateringly expensive! Patrizia and Pierre-Luigi are THE most generous and welcoming hosts. They went above and beyond to ensure we were comfortable and taken care of. The roof terrace is stunning. I wish only we had more time there! Too short. Definitely will return again! Thank you Patrizia so much! Patrizia is one of the nicest women I’ve ever met. She is always there to answer any questions you may have. Just send her a message through What’s App and she gets right back to you. The place is very cute beautiful location with a stunning view. The view is something out of your dreams. It’s close to the center of Massa Lubrense where you can take a bus to Sorrento and go anywhere you want by train or bus (Amalfi, Positano, etc). It’s a nice calm change of pace from the crazy touristy areas. But close enough if you want to visit them. If i come back i would definitely stay here again. Patrizia's place is paradise. We had the best time. Its beautiful and calm and just amazing! This is the most relaxing place I have ever stayed at. Massa Lubrense is amazing, its a 10 min walk to a little local beach which is perfect when you want to get away from the crowds of the big cities. The restaurants are delicious! Take Patrizia's recommendations, they were awesome. She was welcoming and warm, very helpful!! Rebecca and Frederik, two beautiful people, exemplary guests, I would like to host them again, maybe with the first baby. The villa where we were staying was just the best!!! It had everything we needed and even more! Garage was a great feature for these who are traveling by car. Views from the upper terrace was simply unbelievable - we spent a good time watching sunsets and eating pasta and drinking local wine in there! Location is perfect as well - it is close to Sorrento (which we loved) and to many other attractions. Good restaurants with amazing views were close by as well as food and wine stores. Positano and Amalfi are just 10-15 miles away, if you don't mind driving these windy roads. Bus station is very close if you need to take a public transportation. Port from which you can take a boat tour is around 2 miles away and closest public beach is around 6 miles away. Patrizia was an amazing host and helped us with everything we need. She was also nice enough to give us a bottle of Prosecco at arrival and brought to us buffalo mozzarella (which was delicious!). As i said - you couldn't ask for better place to stay than this charming villa! Beautiful outbuilding at 800m. the navy Lobra, where you can book sightseeing tours for Capri, Positano, Amalfi, rent boats with or without sailor. Characteristic marina visible from the terrace of the garden annexe. Bus stop in the house. Prenotazione con caparra confirmatoria pari al 50%del prezzo pattuito.Saldo alla consegna dell'appartamento più deposito cauzionale di euro 150,00. Nel caso di cancellazione la caparra verrà trattenuta Pulizia finale 50 euro a settimana. Final Cleaning 50 euro per week E' compreso nel prezzo:biancheria letto,bagno,cucina.Consumo acqua luce gas,wi fi,posto auto in parcheggio privato. Arrivo previsto dopo le ore 12;partenza non oltre le 10 del mattino.